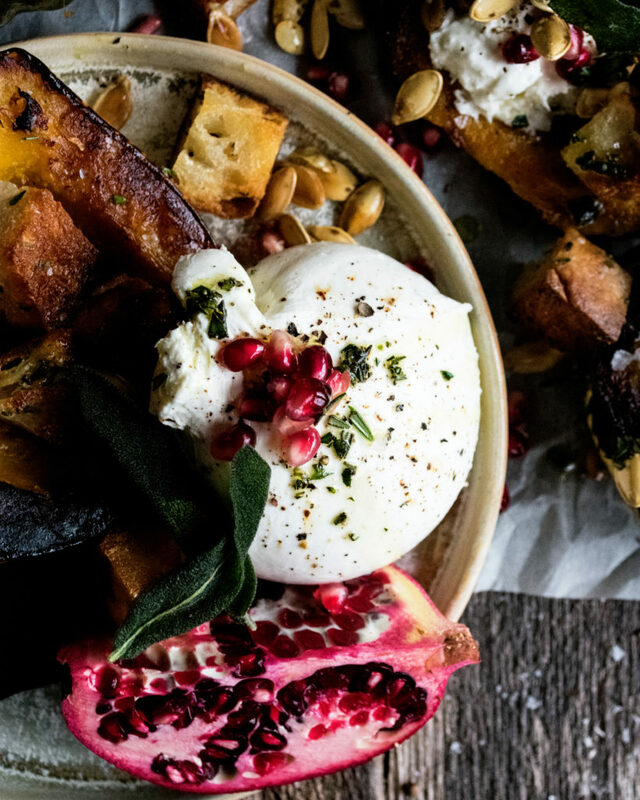 This festive starter is exactly what you need on your table right now. 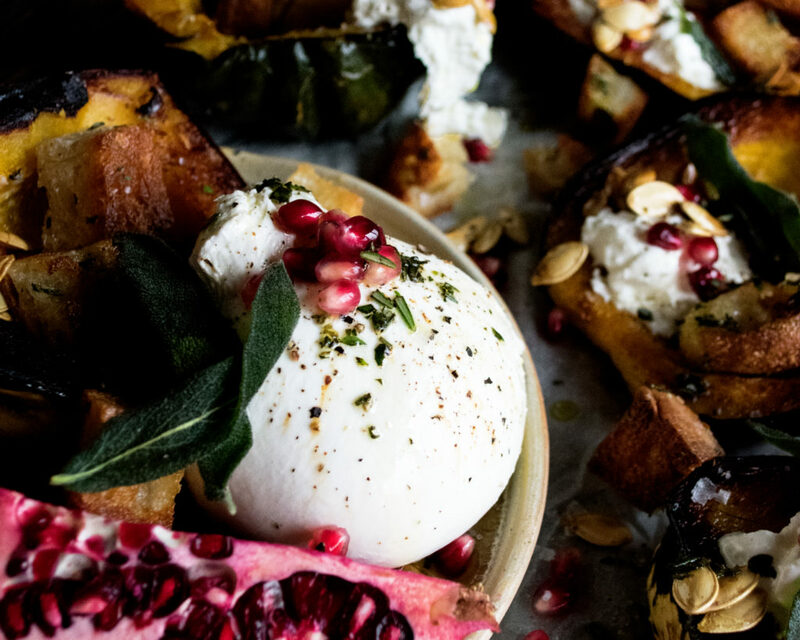 It’s roasted acorn squash with burrata & herbed ciabatta croutons…fun, messy, and delicious. You know how in the summer it’s all too easy (and good) to slice up some tomatoes, break burrata cheese over top, season it all really well, and call it a day? Well, this is my fall version of just that. And I’d say just the looks of it screams holiday entertaining! Acorn squash halved and roasted until tender and caramelized. Coat them well with oil and season generously. Then, just let the oven do its thing. Toasted squash seeds. While the squash roasts, take all of the seeds and dry roast them in a hot skillet until golden. Adds a crunchy, festive touch. Creamy burrata cheese broken over top. Yes, yes, yes. 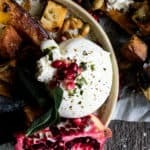 I love burrata all year long, but it’s especially fun to serve around the holidays. Season it really well with course salt and freshly cracked black pepper. Fresh bread, cubed and toasted into croutons. When hot, toss them with olive oil and lots of herbs. These are HEAVENLY. Herb oil. Save some of those herbs and toss with a little bit more olive oil on their own to drizzle over the top of everything. Pomegranate seeds to finish. Because they’re beautiful, juicy, and add a pop of sweetness. I’ve used 4 acorn squashes here, each cut in half. So basically enough for 8 decent servings or some leftovers. 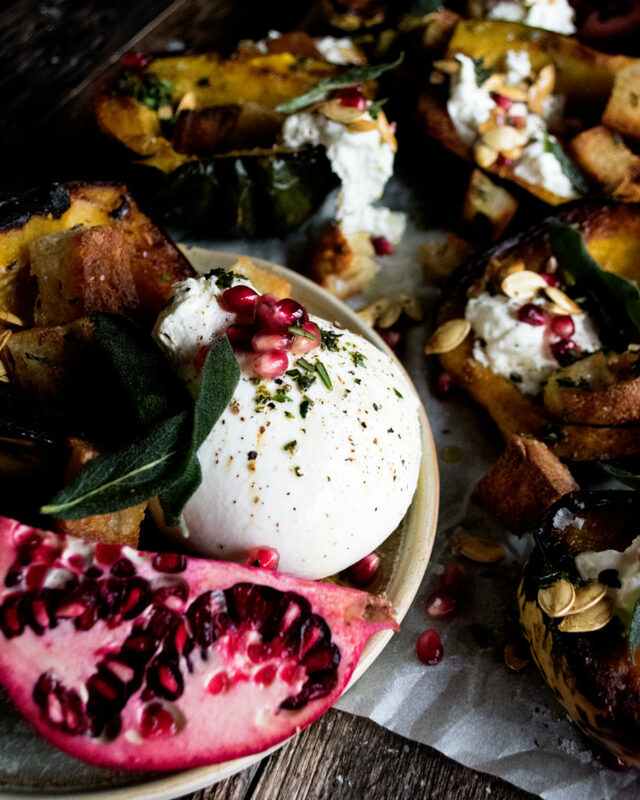 If you’re serving a crowd this for Thanksgiving as an appetizer or side dish, you can probably assume that each person won’t eat a whole half of a squash. Rather, they’ll probably cut one in half, turning this into enough for roughly 14-16 people. Point being, this works really well for a crowd. And you can always buy more squash and simply up the quantity of the other components as well. Enjoy! If you make this recipe, be sure to leave a comment or tag me on Instagram! I absolutely love hearing from you and seeing all of the dishes that you make. 1. Preheat the oven to 375F. Take the halved acorn squash and carefully trim a slice off the bottom of each so that they lay flat. Place the squash flesh-side down onto a sheet pan. 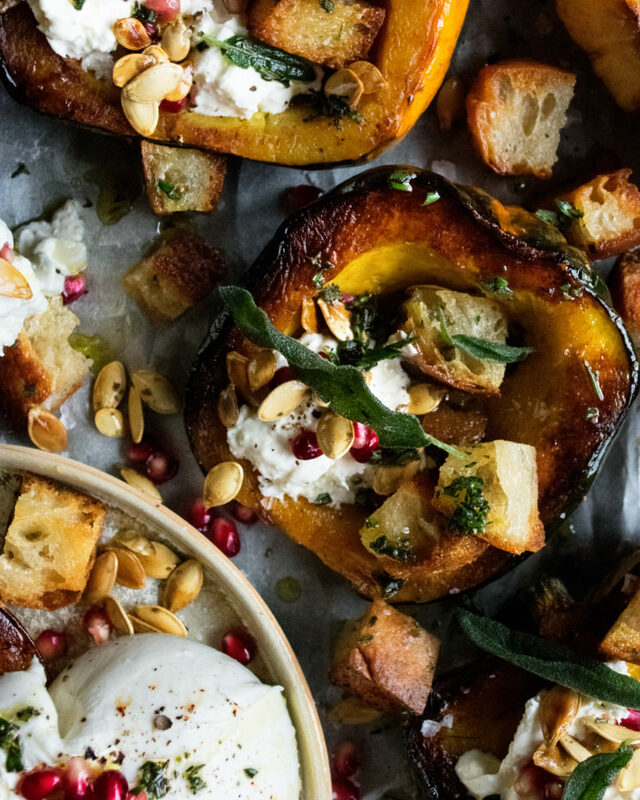 Coat all sides of each squash with a generous amount of olive oil. Season with a pinch of salt. 2. Roast for 40 minutes. Raise the heat to 425F. Continue to roast for another 10 minutes, or until caramelized and tender. 3. Meanwhile, remove all the squash bits from the squash seeds. Rinse the seeds under running water and dry very well. Heat a cast-iron skillet over medium heat. Once hot, add the seeds to the dry skillet. Toast until golden brown, about 6 minutes, stirring often. 4. Transfer the seeds to a bowl and toss with a tablespoon of olive oil and a good pinch of salt. Set aside. 5. To the same skillet, add enough olive oil to come up the sides about a ¼ of an inch. Heat over medium heat. When the oil is hot, add the cubed bread. Toast until golden brown, stirring often. 6. Use a slotted spoon to transfer the bread to a large bowl. Immediately toss with 1 tsp of each the rosemary, oregano, and sage, as well as a generous pinch of salt. 7. Transfer the remaining herbs to a small bowl, cover in 3 tablespoons of olive oil, and reserve as a garnish. 1. When the squash is done roasting, flip each half over onto a platter so that the flesh side is facing up. 2. Break the burrata cheese over top. Season the cheese with kosher salt and freshly cracked black pepper. 3. 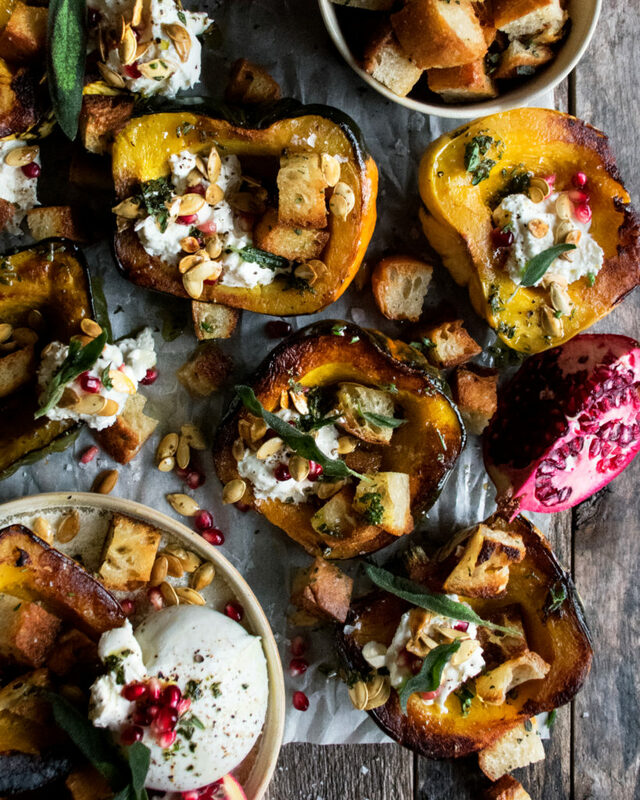 Garnish with the toasted squash seeds, ciabatta croutons, herb oil, and pomegranate seeds.